Take airlines for example. They have Priority Zone 1 boarding. But they give it to all their frequent flier program participants, anyone with their airline credit card, and those who purchased upgraded boarding pass. When boarding for Priority Zone 1 is called, half the passengers qualify and rush the gate to board. Our work feels like this, 8 important things rushing at us, each vying for our attention. Each thing feels important at that moment. We go with the most urgent. The reality is, multiple priorities means no priority at all. Multiple priorities means no priority at all. I tried wearing bifocal glasses once. Bifocals have a distant focus at the top of the lens and a reading focus at the bottom of the lens. Two focuses help the person to see well in two different ways. For me, they just made me feel sick! My brain had trouble adjusting to the two drastically different focuses. Going down stairs I almost tripped and fell as I looked down through the reading part of the lens and became disoriented. With this lens analogy, you still can’t focus on two things at once. You can only go back and forth between them. Multitasking in your work is like rapidly moving back and forth between different lenses. One study showed it takes an average of 23 minutes to regain focus on a task after being interrupted. Just like bifocal lens, we become disoriented when we switch priorities. It takes an average of 23 minutes to regain focus on a task after an interruption. If your priority is planning the big conference coming up in 4 months, then conference planning is the first work you get done each day. Anything that gets in the way of working on the big conference you put aside because it is not your priority. It’s not that everything you do is related to the conference. It’s that when there’s a conflict in how you spend your time, energy, and resources, the big conference will always win. Because it’s the priority. When the big conference doesn’t need your attention, you can work on other projects. By the way, it’s okay to have a priority at home, a priority in your work, and a priority in your free time. These different domains of life often function independently. Your priority will shift over time. It just shouldn’t shift twice a day. What causes us to not make a priority or stick to it once we have it? For those with a supervisor assigning tasks, it could be that it’s not really up to you. For those with more autonomy in their work, I think it boils down to FOMO, the Fear Of Missing Out. We may know our priority, but we don’t want to stick to it because we also want to do many other things. Blogging is great, but I don’t want to miss out on Podcasting. And then there are webinars. And Facebook Live videos. And I better publish articles too. Each of these are good things. But I can’t prioritize them all. If I try, I don’t do any of them well. Yet, I feel I’m going to miss out if I don’t do these things. I don’t want to say “no” to any opportunity because I never know what could happen by doing it. The reality is I do know what will happen if I try and do all the opportunities that come my way. I won’t do them as well as I could. I’ll delay doing other things that will turn out to be more important. FOMO keeps me from doing one thing in an excellent way. So, now it’s your turn, the first step is to gain focus: What’s your priority in your work? Decide and commit to a priority. Then, take a look at how you actually spend your time at work. 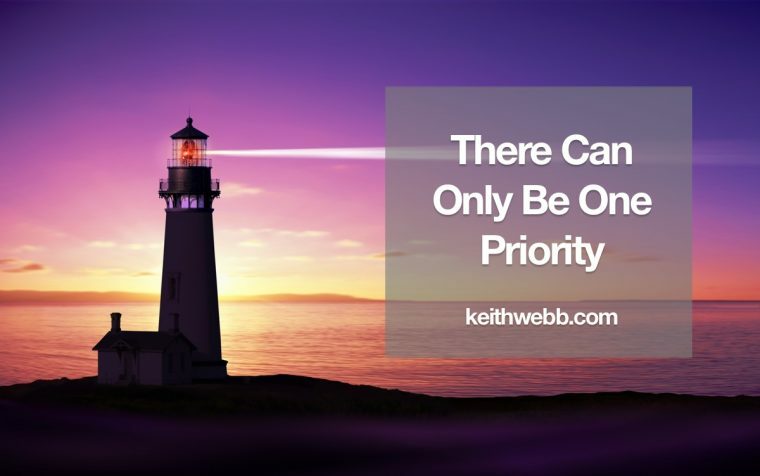 Is your priority getting your best time and energy? If not, block time in your calendar to work on your priority. Question: What possibilities would knowing your priority open for you? You can leave a comment by clicking here. 15 Airline Perks You Can Get for Free. You’ll Love #3!